Nerva (Marcus Cocceius Nerva, 8 November 30 – 25 January 98) was Roman Emperor from 96 to 98. Nerva became emperor at the age of sixty-five, after a lifetime of imperial service under Nero and the rulers of the Flavian dynasty. Under Nero, he was a member of the imperial team, and played a vital part in exposing the Pisonian conspiracy of 65. Later, as a loyalist to the Flavians, he attained consulships in 71 and 90 during the reigns of Vespasian and Domitian respectively. On 18 September 96, Domitian was assassinated in a palace conspiracy. On the same day, Nerva was declared emperor by the Roman Senate. As the new ruler of the Roman Empire, he vowed to restore liberties which had been cut during the autocratic government of Domitian. Nerva's brief reign was marred by financial difficulties and his inability to assert his authority over the Roman army. A revolt by the Praetorian Guard in October 97 caused him to adopt an heir. After some deliberation Nerva adopted Trajan, a young and popular general, as his successor. After barely fifteen months in office, Nerva died of natural causes. Although much of his life remains obscure, Nerva was considered a wise and moderate emperor by ancient historians. 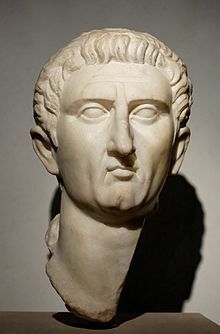 Recent historians have revised this assessment, characterizing Nerva as a well-intentioned but ultimately weak ruler, whose reign brought the Roman Empire to the brink of civil war. Nerva's greatest success was his choice of Trajan. This led to a peaceful transition after his death, thus founding the Nerva-Antonine dynasty. ↑ Grainger, John D. 2003. Nerva and the Roman succession crisis of AD 96–99. London: Routledge. ISBN 0-415-28917-3. This page was last changed on 13 August 2018, at 04:19.